We use to spend our holidays relaxing eating too much food and enjoying our time off from work with friends and family. But, when Dwayne “The Rock” Johnson was spending the holiday with his family, he thought it would be just like any other day. Well, it would have been… if not for the two new additions that Johnson recently added to his family, by the way of two very cute French Bulldog puppies. When the puppies were taken out into the backyard for the very first time to learn how to do their thing, their dog dad thought they would just go out to the grass and naturally go ahead with their business. 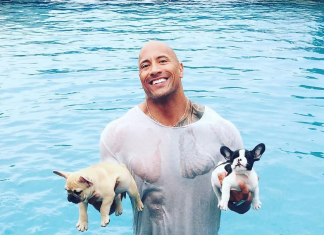 Little did he know, they had other plans–as not one, but both puppies, walked straight into the pool! Without a clue on how to swim, the pups quickly sank. Almost instantly The Rock sprung into action to save the day–but of course, not before forgetting to take his cell phone out of his pocket! That’s one dedicated new dog dad! Take a look at the adorable photo below. It looks like Brutus and Hobbs are in good, strong hands!